Additional information: Carnelian, also known as “red agate,” is a semi-precious gemstone—a form of chalcedony tinted by iron oxides. It occurs in a range of colors, from milky white to to an earthy red-brown. Carnelian has been used since ancient times as a decorative element in jewelry. Some cultures also saw magical qualities in the stone, believing it could instill courage in battle, promote fertility and cure illnesses. Historically, carnelian was mined in India or Brazil and then traded around the world. It made its first appearance in Africa when Arab traders began carrying the stone with them on their trips across the Sahara. Carnelian fetched a high price in the bustling trading centers of West Africa and remains a sought-after commodity there, especially among the Fulani, Wodaabe and Tuareg peoples. 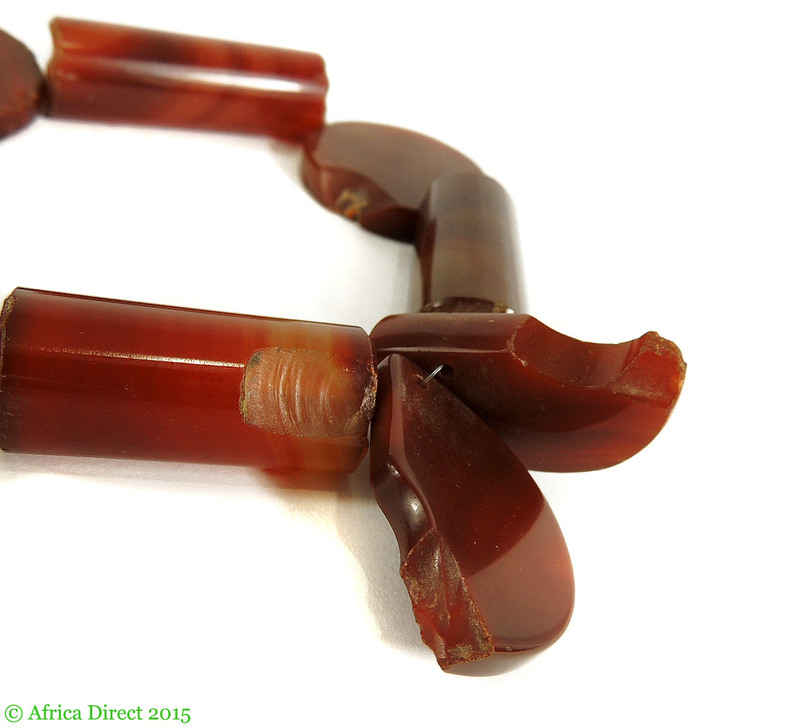 Most of the carnelian beads in Africa came originally from India, or from Brazil by way of Idar-Oberstein in Germany. The Indian beads are generally smaller and, because they have not been treated, the separation between colors remains cloudy. Beads cut in Idar-Oberstein, on the other hand, have much more clearly defined colors with distinct striations. Idar-Oberstein is rightfully famous for its stone-cutting and other lapidary expertise. In the late fourteenth century, amethyst and agate were discovered near the previously obscure German towns of Idar and Oberstein. By mining these raw materials, tapping into the power of a local river, and taking advantage of advances in chemistry, the region quickly positioned itself as a major player in the gem-processing industry. Idar-Oberstein’s gem workers had a number of carefully guarded secrets. 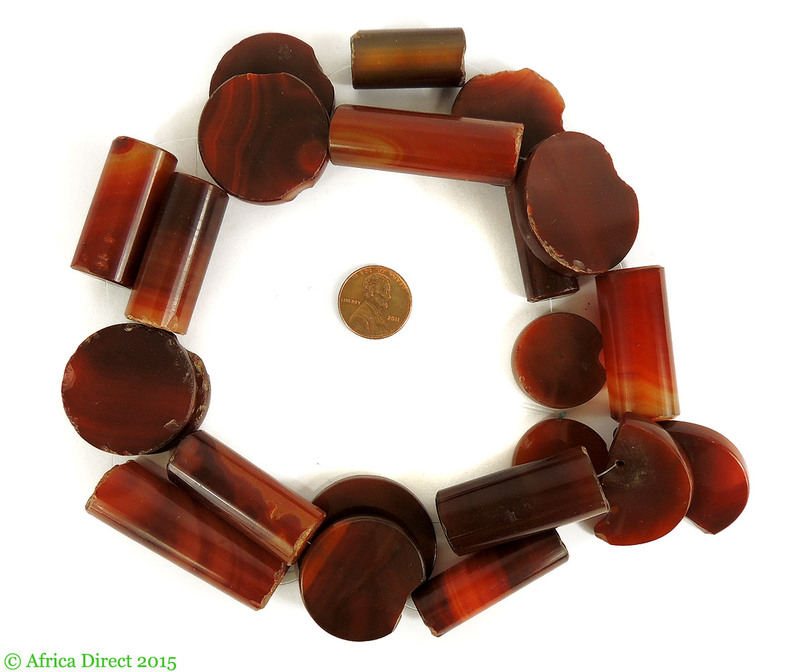 To enhance the color of raw agate, for example, they would soak the stone in a solution of melted-down iron nails. There are many imitations of I-O beads, most of them products of the Czech-Bohemian bead industries. Occasionally a strand of genuine I-O beads will include a glass fake or two. 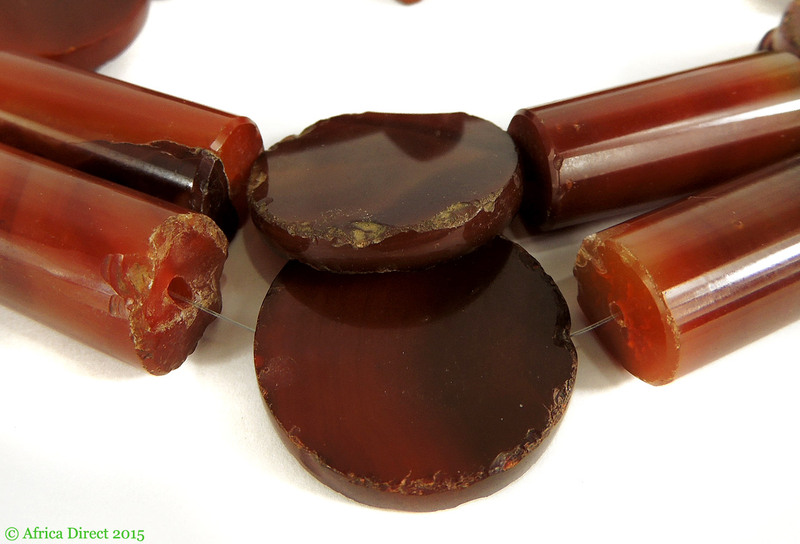 When you see carnelian beads that seem old but are rounded on the edges, they are probably from India. The most common I-O beads are faceted, but there are also cylinders, “coins” and a number of other cuts and shapes.